Restorative Yoga is the radical, counter-cultural experience of simply being. A few years ago I enrolled on my second Yoga Teacher Training course for a year at the Yoga Academy Auckland – I was on a mission to learn more about this practice and to equip myself with as much knowledge as I could. If I was going to teach Yoga, then I wanted to be good at it. About half way through the year, course tutor Jude Hynes gave us a new practice, brought out some Yoga bolsters from the cupboard and introduced us to the wonderful world of Restorative Yoga. In the first pose Jude gave us – Supported Bridge Pose – I was lying back over the length of the bolster so that most of my body was on the bolster, but my head and shoulders on the floor. It was an effortless bridge pose. I can still remember this experience: the exact moment when I felt a true relaxation response* deep within me. Tension melting, my body softening, a delicious sort of resting – along with an insight that something very important for me had just occurred. It was clear right then that Restorative Yoga was most definitely a practice I wanted to explore further. Luckily at the Yoga Academy there was already a teacher specialising in Restorative Yoga – Karla Brodie – and I spent many sessions learning from her, studying with her and we became wonderful friends. We now work together regularly on teacher training programs and retreats. Karla, like our teacher and mentor Donna Farhi, is always developing her approach, enquiring and learning. Restorative Yoga has it’s background in the work of B.K.S. Iyengar who has pioneered the use of props to help support the body in Yoga postures. Other Iyengar style teachers such as Judith Lasater have evolved the practice and written extensively on Restorative Yoga. Judith Lasater’s Relax and Renew is an indispensable resource for anyone wishing to know more (see resources below). Whilst our culture promotes a never ending amount of doing, Restorative Yoga is the radical, counter-cultural experience of simply being. It’s no surprise then that my Restorative Yoga sessions are my most popular classes. I regularly run “The Big Relax”, 2½ hours of Restorative bliss – it always books out and the only reason I don’t take more people is because floor space is limited. In regular classes, a Restorative posture or two as an ease down towards Savasana is always greeted with wonderful enthusiasm by students. And in my daily life I have found that practicing just one Restorative pose each day, even if it’s just for ten minutes, brings a valuable balance to my busy life (Legs Up The Wall, Viparita Karani, is a favourite). Our culture is built on how productive we can be, how much we can achieve and keep achieving. It can feel as if nothing is ever enough. We can even observe this within the Yoga community itself. As a teacher I often witness the striving for a bigger practice, a more “advanced” practice, the strain to push the body towards extreme positions, and students ignoring the pain that comes with such a practice. I’ve been there myself – in the first few years of my Yoga I pushed my body into postures I saw in books (which had titles such as ‘Learn Yoga In A Weekend’), demonstrated by yogis with an alarming degree of flexibility. To yield is to surrender. In Restorative Yoga we actively (i.e. consciously) surrender our tension to the force of gravity. We keep relaxing and softening throughout the practice. It is, in fact, a delightful process because for most of us letting go of tension brings great relief to our body and mind. Due to this yielding being an active process, Restorative Yoga is not about collapsing into each posture, as we might slump into an old armchair. Instead, yielding allows us to be in a clear and dynamic relationship with our environment, so that we are very present to this softening of stress and tension, present to what may be revealed from letting go. Indeed, Yoga may be seen as a practice of revelation – by practicing Yoga we reveal what is obscured by our stress – a lighter, softer, more energised, clearer, heart-centered Self. There’s a beautiful relationship between yielding and breathing. As we learn to actively release tension, our breath may naturally become freer, more at ease. It returns back to a more natural flow – a relaxed breathing pattern. It is very enjoyable when our breath is allowed to flow unimpeded through our body. When I talk about breathing though I am not talking just about inhalation and exhalation. At a more internal level – a cellular level – our body breathes. In fact it is our cells’ need for oxygen and nutrients that ultimately drives our breathing process. With it’s emphasis on conscious deep relaxation, Restorative Yoga invites fuller respiration at a cellular level. Healthy cells which breath fully are vital and alive. Where breathing is restricted, cells struggle to function efficiently, and in areas of chronic tension and contraction, cellular breathing becomes restricted. As a teacher of Restorative Yoga, a mainstay of my classes is facilitating students into an experience of their cellular body, of cellular breathing. It is one of the most nourishing practices I know for the body, so very restful and rejuvenating. It’s a fascinating statement to make, at once boldly debunking the myth that advanced Yoga is about mastering complex physical postures, while directing students towards a subtler, more refined practice. This is not to say that good Restorative Yoga is not challenging. An hour’s worth of cellular breathing demands great presence and attention. It certainly helps when we set our Restorative postures up really well, as the resulting ease-of-being means our attention and focus won’t be distracted by discomfort. An important part of the practice is learning about setting up the props with precision and intelligence. Like all Yoga, these postures should be modified to suit each individual – for example, someone with sore, tight neck and shoulders should have a different set up to someone who does not. A prop that is moved a few centimeters here or there can make a world of difference. We can treat each posture as an enquiry – how do we set up to offer profound support and optimal comfort? With this enquiry approach we remain present, in the moment, self-adjusting along the way. The same posture today may require a slightly different set up from last week. Thus we create a practice which is responsive to what is being presented in each moment, always moving us towards greater balance and ease. My colleague Karla Brodie, in her classes asks her students to insist on “impeccable standards of comfort” for themselves. A “Gold Class Standard”. We should look for ultimate comfort for all our body systems – our nervous system, muscular, skeletal and organ systems, the fluid body and so on. It is Restorative Yoga’s profound effect on the autonomic nervous system that is a crucial element to it’s power. Modern day stressful living means that for most of us our sympathetic nervous system is constantly firing without any real opportunity of quieting – we are constantly in a state of of flight or fight. Restorative Yoga is a perfect antidote. With it’s emphasis on deliberately slowing down and optimal comfort and ease, the practice activates the parasympathetic nervous system, responsible for resting and digesting, restoring easy breathing, lowering blood pressure and heart rates, relaxing tension, and bringing greater balance. In support of our joints, no joint should be left hanging in space. Looking at one of the classic Restorative Yoga Postures – pictured – Supported Reclined Bound Angle Pose (Salamba Supta Baddha Konasana) – the arms are supported by the blankets. I’ve seen students practice this without arm support, their elbows dangling mid-air. While this may initially give more sensation of opening across the shoulders and chest, after a few minutes, the sensations may become quite intense. The weight of the bones pull the arm away and out from the shoulder socket. There follows a response from the nervous system and surrounding body tissues that creates stress and tension around the joint to “hold on” and this is the opposite experience we are looking for. The aim of Restorative Yoga is to induce rest and ease. Yes, the postures may gently open us to encourage greater energy flow, but this can best be achieved by sending a message of comfort, safety and cohesion to the body. When every joint is beautifully supported, the body receives this as a message of kindness and responds – ahhh … I am safe to soften, safe to relax. In this way our Yoga practice becomes an engaging and responsive dialogue between our body and mind. I have witnessed again and again the effectiveness of this approach, not only our physical and energetic levels, but also on our emotional, mental and spiritual well-being. Restorative Yoga holistically works on all our Koshas. While we can practice these Restorative postures separately, or towards the end of a general class, a whole, extended session of Restorative Yoga can be immensely beneficial, consciously giving all the body systems the time to relax back towards refined balance. When we practice such an extended session we should be aware that the sequence we practice the postures in may have different effects – sedating, rejuvenating, affecting the flow and direction of energy and so on. Judith Lasater suggests that any well-sequenced Restorative practice should include at least one inversion, to help counter the effects of gravity. Essentially, sequencing postures comes down to practicing safely, creatively and responsively. We must begin to truly understand Yoga Asanas, how they work, what their effects are, how they may relate to each other, so that we practice in an order that makes sense for our particular being, in this particular moment. By emphasizing impeccable standards of comfort and wise sequencing we may embody sustainability in our practice. In setting up our postures, we may ask ourselves whether we can stay in the pose for an extended period of time without discomfort. Optimal ease means we can sustain the practice for longer. The benefits gained from Restorative postures are enhanced with time spent in the postures, i.e. spending 25 minutes in a comfortable Supported Reclined Bound Angle will be more beneficial than 5 minutes in the same posture which is set up to give stronger sensations. In service to a sustainable practice, we can set up our Restorative Yoga postures in a way that creates smooth transitions in the flow of our body. As we position ourselves we may establish gentle undulations, our body like a languid rolling river which encourages energy flow through relaxation. There should be no excessive drop or incline along the lines of the body. This is a key point – as Yoga practitioners many of us love moving our bodies, stretching and strengthening ourselves. We love the sensations of all this movement. And that is all fine, good and necessary. It is satisfying indeed to connect into the body and delight in the sensations of it all. Yet we can go further. We should be aware that Yoga is a tradition that spans thousands of years and we have the blessed opportunity to drink deeply of its offerings. However, we may be caught by attaching only to the strong sensations of practice – even practicing in a way which only brings greater and greater physical sensation. Living in our computer orientated virtual world has dis-connected us so much from truly inhabiting our body that when we do attempt to connect it’s in a harsh and severe way. In Restorative Yoga we may counter this cultural tendency by leaning our practice towards neutrality. We may cultivate an attitude of real contentment with less sensation and instead encourage a healthy curiosity towards more neutral sensation. With quieter sensations we may be drawn into an inner space and explore our internal landscape. Yoga may draw us into subtler experience – a beautiful inner journey towards our True Nature. It seems somewhat lost in much of modern Yoga – the original purpose of the practice, to return us to a Self-Realisation of our innate True Nature, or original wholeness, completeness and goodness. With it’s emphasis on profound rest we have the opportunity in Restorative Yoga to move into the “quieter” practices of Yoga. Yoga Asana does not have to be separate from other limbs of Yoga – Pranayama (enhancing the flow of vital life-force energy), Pratyahara (balancing the senses), Dharana (concentration), Dhyana (meditation) and Samadhi (Self-Realisation). Although a longer discussion on these aspects of Yoga would be valuable for some other post, we may acknowledge that Patanjali presented us the Eight-fold path as “limbs” rather than stages or steps – they intertwine like the branches of a tree, supporting each other. They may all be present in our practice. In the quietness of a Restorative practice we may tune into our breath, even on a cellular level. We can relax the senses so they may be more in balance with how we interact and receive the environment around us. We can learn to focus our attention and sustain that focus throughout the practice, and finally arrive simply and perfectly in the moment, with a remarkable acceptance, presence and responsiveness to this moment. It becomes a graceful relaxation back into our True Nature. This is the culmination of a wise and mature Yoga practice. And practice is the appropriate word! We may allow the beauty of Yoga to draw us back in, again and again, day after day, year after year, with the promise that these rewards are guaranteed. Neal Ghoshal and Karla Brodie are delighted to be offering this spring retreat again after the first one sold out so fast at stunning Mana Retreat Centre, Coromandel. This nourishing weekend will include active yoga, long restorative practices and iRest™ Yoga Nidra. For more details see Neal’s website: Sacred Moves. 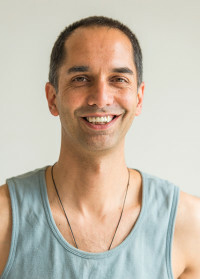 Neal has been practicing yoga for sixteen years and teaching since 2003. He sees yoga as a map guiding us home to a place of peace and relaxed openness in each moment. He enjoys creating a safe and inviting space in which to learn and discover yoga as a balance between effort and effortlessness, structural alignment and organic fluidity, mindfulness and spontaneity. Neal teaches as part of the faculty on Donna Farhi’s Advanced Teacher Training. 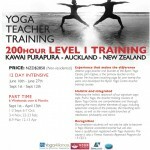 Neal and Karla Brodie offer Restorative Yoga Teacher Training as part of the programs they currently offer at Kawai Purapura Centre in Albany, Auckland. Please contact Kawai Purapura to find out more. This article would not have been possible without the support, teachings and writings of Donna Farhi, Karla Brodie, Judith Lasater, BKS Iyengar, Richard Miller and others. My heartfelt gratitude always. *The Relaxation Response was a phrase coined by Dr. Herbert Benson in the 1970s. Dr. Benson was a Harvard professor who pioneered research into physiological response to meditation. I love this article. Really solid. I know Yoga is rad in general. Now that you have emphasized the counter-cultural tendency of the restorative and yin practice, I love practicing it and sharing the experience with other people even more now. Thank you for the valuable content. Thank you Lea – so glad that you enjoy Restorative Yoga – it’s a beautiful journey! i love this article thank you. This was an awesome article with numerous excellent points. I like that you grounded it in evidence and experience. Namaste.